We at Rejigit are of the view that public space, works of sculpture can be an extraordinary asset. Cloud Gate is such a public sculpture by Indian-born British artist Sir Anish Kapoor, The elliptical piece is the centrepiece of AT&T Plaza at Millennium Park in the Loop community area of Chicago, Illinois. Constructed of polished stainless steel and comprising 168 welded pieces. 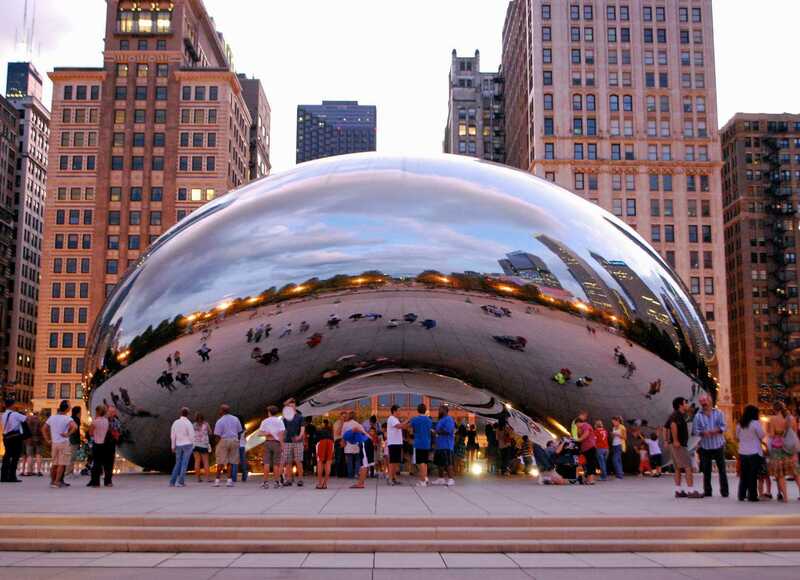 The piece has been likened to a chrome bean and Kapoor’s inspiration was liquid mercury. It measures 10m x 20m x 13m and weighs 100 tonnes. A 3.7m high arch provides access to a concave chamber within. The initial production cost estimate was US$3m, the project began with a budget of US$9m and the final cost in 2006 was US$23m. Sir Anish Kapoor was born in Bombay 1954 and he has lived and worked in London since the early 1970’s. He represented Britain in the XLIV Venice Biennale in 1990 when he was awarded the Premio Duemila Prize. In 1991 he received the Turner Prize and in 2002 the Unilever Commission for the Turbine Hall at Tate Modern. Amongst his numerous works are the notable public sculptures Cloud Gate, Sky Mirror exhibited at the Rockefeller Center in New York City in 2006 and Kensington Gardens in London in 2010, Temenos at Middlehaven, Middlesbrough,Leviathan at the Grand Palais in Paris in 2011 and Arcelor Mittal Orbit which was commissioned as a permanent artwork for London's Olympic Park and completed in 2012. Kapoor's work is included in the collections of many international galleries and museums including the Museum of Modern Art in New York City, Tate Modern in London, Fondazione Prada in Milan, the Art Gallery of New South Wales, Sydney, the Guggenheim in Bilbao, the De Pont Foundation in the Netherlands, the Moderna Museet, Stockholm, the 21st Century Museum of Contemporary Art in Kanazawa, Japan and the Israel Museum in Jerusalem. Kapoor describes his body of work as being neither pure sculpture nor pure architecture and he became known in the 1980s for his geometric or biomorphic sculptures made using simple materials such as granite, limestone, marble, pigment, and plaster etc.His early sculptures were frequently simple curved forms, usually monochromatic and brightly coloured and using powder pigment to define and permeate the form. One of Kapoor’s works, Dismemberment, is installed at the Kaipara Harbour farm property of Mr Alan Gibbs. It is constructed of mild steel tube and tensioned fabric and measures 25m x 8m at the western end and 8m x 25m at the east with an overall length of 85m. Rejigit admires Mr Gibbs for establishing his very significant 1000 acre sculpture park. The 2012 biography, "Serious Fun: The Life and Times of Alan Gibbs" by Paul Goldsmith is well worth a read.